There are few things every true gentleman should own, and a good beard grooming kit is definitely one of them. A beard can absolutely up your masculine look, but if it’s not well kept, clean and tidy, you could end up looking more disheveled than dapper. So to keep your dashing aesthetic in check, you shouldn’t be afraid to give yourself a manly manicure once in a while using one of these beard grooming kits for men. From long, short, thick, thin, coarse and even tangled facial hair, Rapid Beard’s grooming kit is ideal for every man. The extra sharp barber scissors will make trimming and shaping your mane as easy as the balm, wax and oil make styling. Containing soothing argan oil, jojoba oil and Vitamin E oil, your skin will also receive a nourishing and revitalising treatment. All products in this set are also fragrance-free and are gentle enough that they won’t cause any adverse reactions. 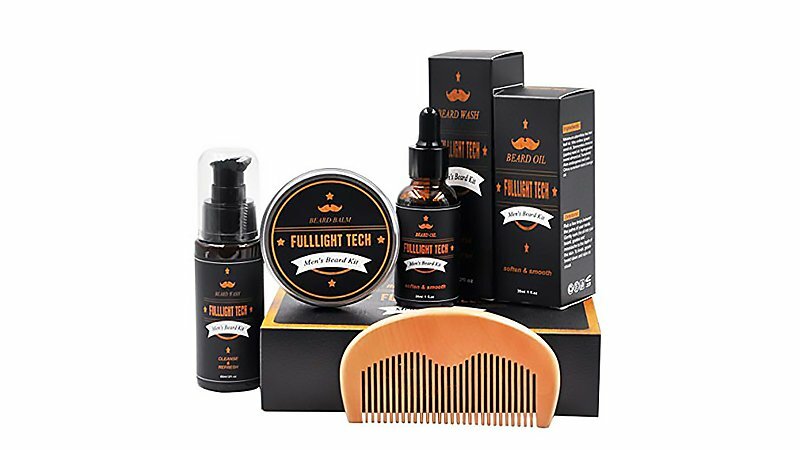 Give your facial hair the ultimate treatment with this six-piece bread grooming kit by Fulllight. The perfect gift for the guy in your life, it comes in a premium box including all the brand’s best products. 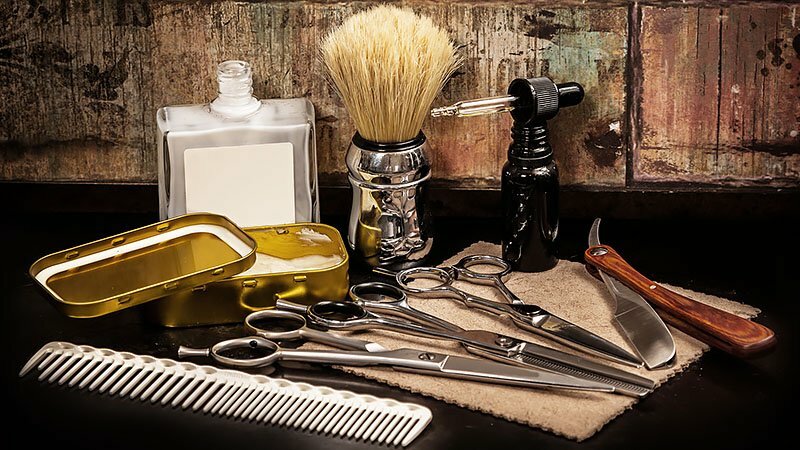 From beard oil to scissors, you will have everything you need to keep your whiskers neat and tidy. All the products in the set are completely fragrance-free with the growth oil containing soothing vitamin E and tea tree oil providing your moustache with natural shine and hydration. The nourishing balm will also have your beard looking lush and healthy. 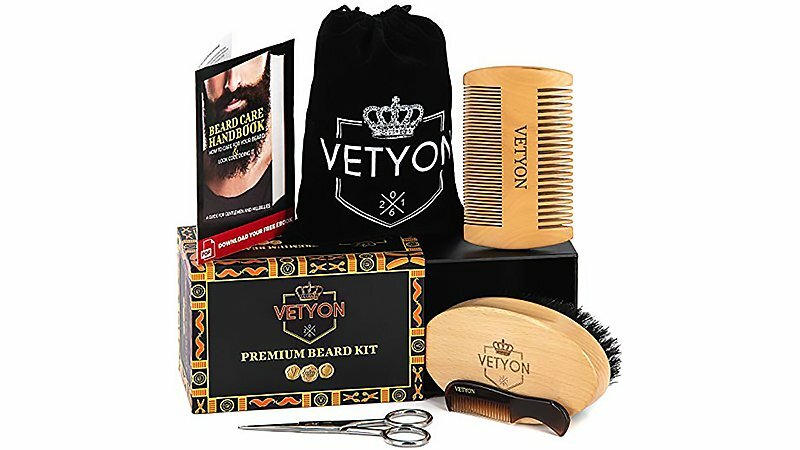 Vetyon are so confident that this will be the best beard kit you every used they are offering a 100% money back guarantee. So, you really do have nothing to lose by giving this set a go. Their grooming tools are made from 100% natural ingredients and are ergonomically designed with a grip which allows for just the right amount of firmness. This means you can effectively remove, trim, and style hair without causing any irritations. It is also specially designed to fit in your pocket; this means you can meet all your grooming needs on the go. Firstly, this comes in a super classy wooden cigar box which not only means there’s no extra wrapping required, but it will also make for a stylish storage box when it’s unpacked. Or, if you want to keep your products in it, it will look great on your basin or bathroom shelf. 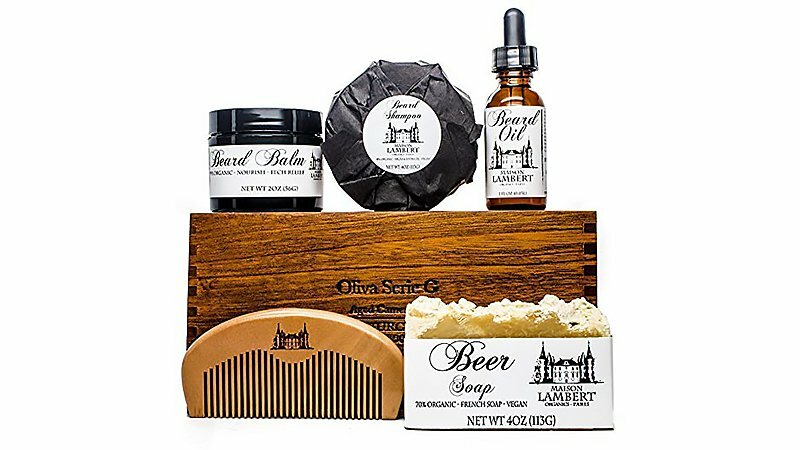 This fancy box includes organic beard balm, organic beard shampoo and wooden beard comb. They also throw in a natural body soap, free of charge. Completely hypoallergenic and artificial fragrance-free, pure essential oils are used to create a subtle, yet pleasing scent that isn’t too overpowering. All Maison Lambert products are also cruelty-free and contain no parabens, sulfates, dyes, or toxins. From 5 0’clock shadow to a sleek moustache or a full-on Viking beard, this grooming kit will get the job the done. 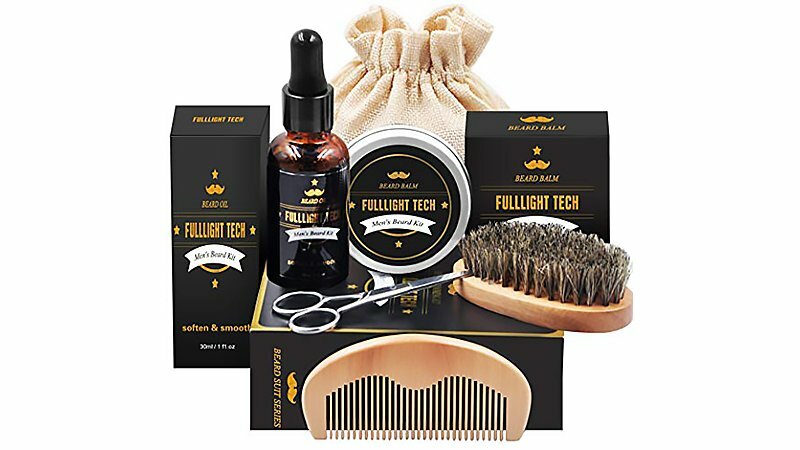 Its complete range of grooming tools and accessories will have you trimming, shaping and styling your beard like a professional barber. In fact, the kit comes complete with a pair of ergonomic barber’s scissors to help you cut your facial hair with perfect symmetry. The comb and durable bristle brush will also help to swiftly remove knots, keeping your mane smooth and tangle free. It also features a nifty beard bib to help minimise the mess, making cleaning up as easy the trim. With 100% natural ingredients, Fulllight’s products are perfect for all skin and hair types. Style and soften your locks with the leave-in conditioner, while the luxurious beard wash will leave your facial hair clean, fresh and strong. Add some shine with the moustache oil and keep your mane in place using the balm. From softening, nourishing, moisturising, cleaning, conditioning, combing and styling, this has all you need to get that dapper and clean cut look. 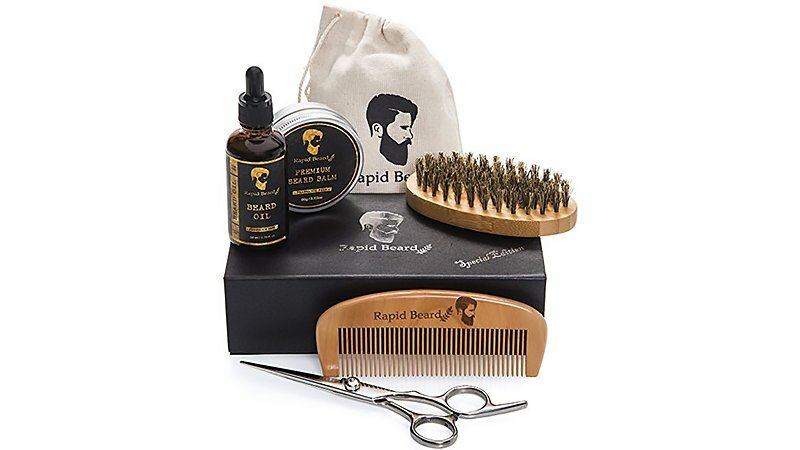 Containing natural and organic ingredients this seven-piece bread grooming kit has all the tools and products to fulfil your daily styling and beard care needs. 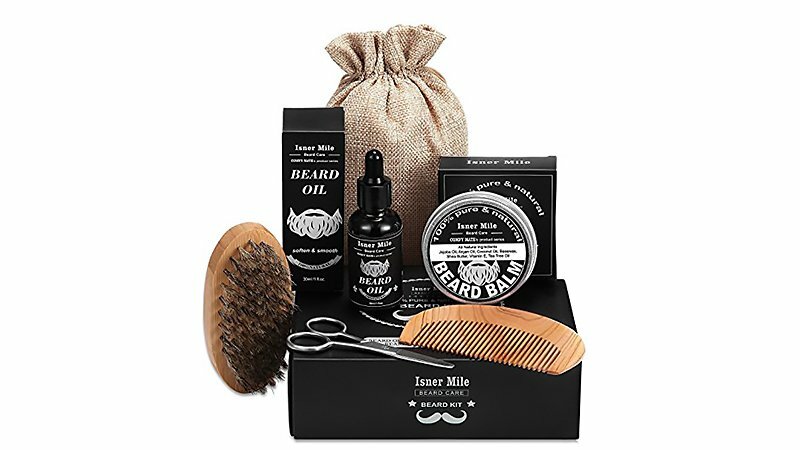 The luxury premium gift box contains beard conditioner balm, a revitalising beard conditioner oil, a beard brush, a comb and moustache scissors. Each accessory and product work together to keep your beard hydrated, moisturised, silky soft, healthy and groomed all day long. The organic and natural ingredients make products suitable for all skin and hair types, no matter how sensitive. Tame your mane with Xikenzan’s bread grooming kit, containing a wood palm brush, scissors, comb, balm and beard care oil. The ultimate set to keep your beard polished and well maintained, this also contains products with ingredients which will hydrate and nourish your skin. This will prevent any irritations and rashes caused by your facial hair or shaving. All products are 100% natural and contain no harmful ingredients, so it is perfect if you have sensitive skin or just prefer kinder brands. 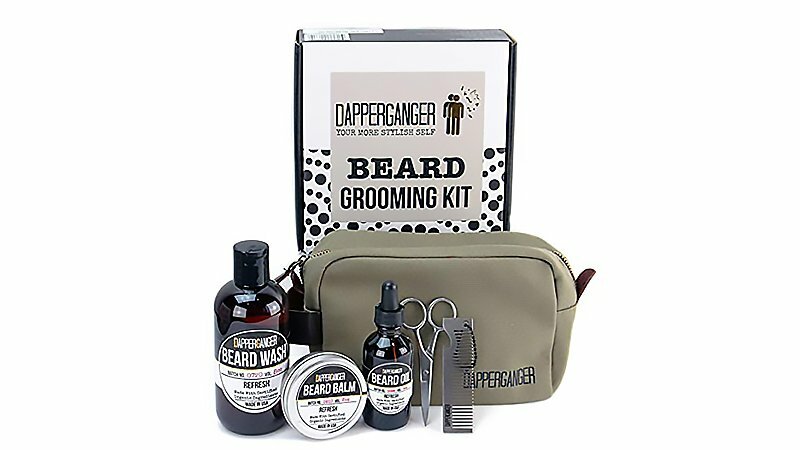 DapperGanger has become particularly popular on the beard grooming kit market. This is because of their stellar reputation for creating practical and functional products. What’s even more impressive about this range is that all of the products are 100% vegan and organic. 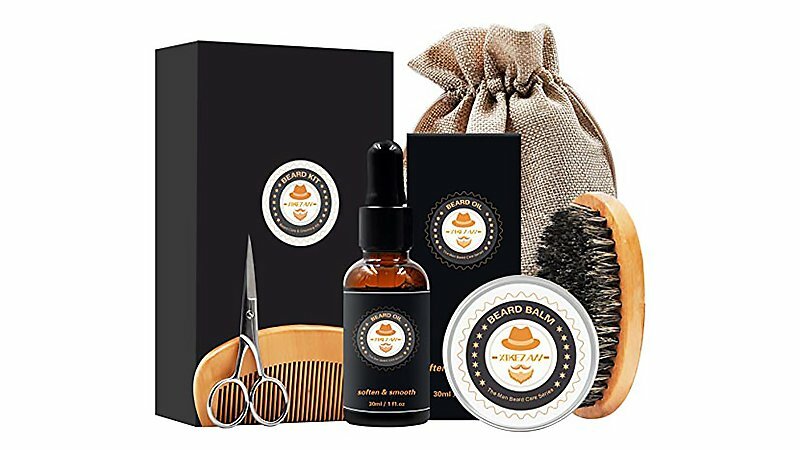 This comprehensive kit comes with full-sized organic bottles for beard oil, beard balm, and beard wash. It also includes a metal beard comb that doubles as a bottle opener and a pair of stainless steel grooming scissors that will give you a clean, true cut every time. It also comes with a handy canvas travel bag which alone would set you back around $30. Mountaineer Brand’s beard grooming kit contains all you need to keep your facial hair smooth, clean cut and healthy. 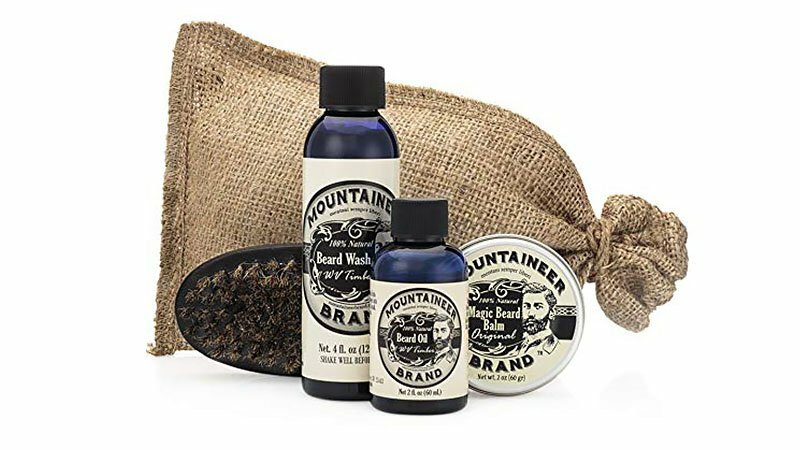 Although the name suggests a rugged or unkempt look, we assure you that Mountaineer’s grooming range will give you a lush and refined beard, while also being decidedly masculine. 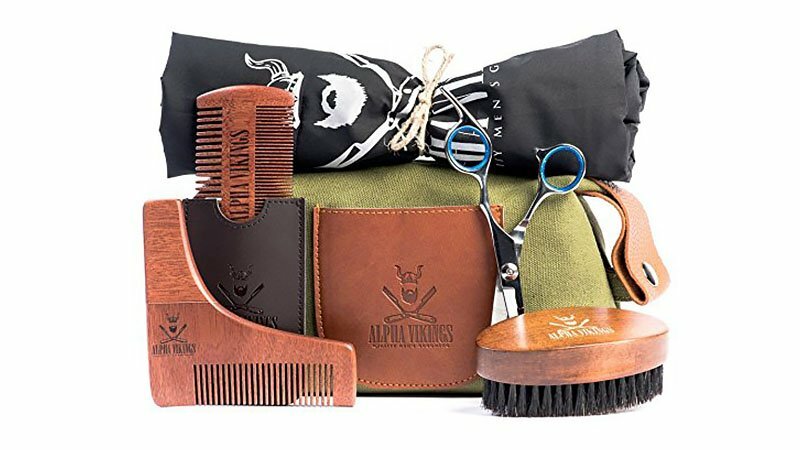 Their beard grooming kit includes beard oil, beard balm, beard wash, and a military-style (oval) beard brush and comes in a cool burlap bag. All products are also 100% natural containing zero nasty chemicals. While not fragrance-free, the scents are subtle and fresh including grapefruit, lime, and fir needle.